(Bloomberg) -- When Elon Musk was accused earlier this year of violating a months-old agreement that he clear material tweets about Tesla Inc. with a company lawyer, the billionaire told a federal judge he took his accord with the Securities and Exchange Commission seriously, and that he had dramatically reduced his postings about the electric-car maker. Then, he went back on a binge. 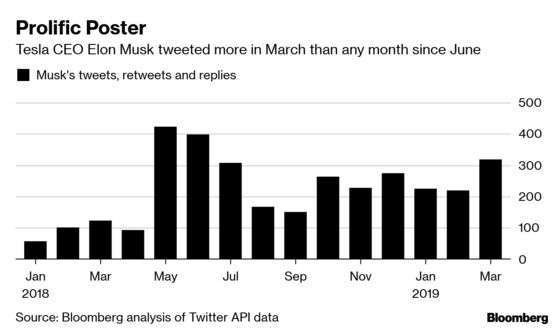 Musk sent more Tesla-related tweets in March than any month since June, according to a Bloomberg News analysis of his activity on the social network. He began the month trying to placate customers irritated by price changes for Autopilot, Tesla’s driver-assistance system, and ended it with posts about the Semi truck he’s eager for Tesla to start producing. In the middle of what turned out to be a prolific month, Musk, 47, responded to the SEC’s request for a judge to find him in contempt. He said March 11 that in the three months after entering his settlement with the agency, his average monthly Tesla-related tweet count was almost half what it was in May, June and July of last year. The Tesla chief executive officer may have overstated his restraint. 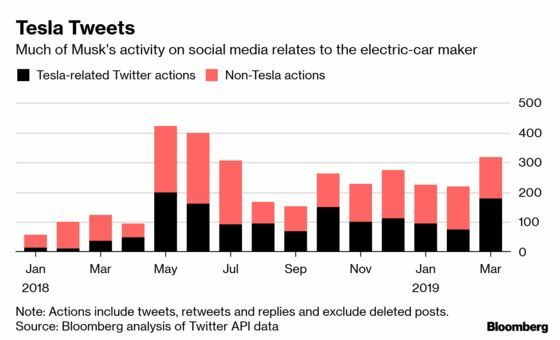 He posted 102 Tesla-related tweets, retweets and replies a month in November, December and January, Bloomberg found in its analysis of Twitter API data. That’s a reduction of roughly a third from the 150 Tesla-related posts averaged monthly in May through July. A Tesla spokesman said Musk’s retweets didn’t factor into his Tesla-related tweet count, and this accounts for a large portion of the difference between his calculation and Bloomberg’s figures. Either way, the spokesman said, Musk’s Twitter activity related to Tesla fell significantly in the time period he cited. The SEC and U.S. District Judge Alison Nathan haven’t seemed particularly concerned with this claim by Musk, perhaps because this aspect of his defense was somewhat beside the point. The settlement that the Tesla CEO reached with the SEC last year didn’t place limits on the volume of his tweets about the company. Instead, the regulator sought to force Tesla to put disclosure controls and procedures in place so that if Musk wanted to tweet material information about the company, the posts would be vetted for accuracy. The SEC said the September agreement was designed to protect investors after Musk sent tweets about taking Tesla private that the agency called false and misleading. The regulator has alleged he violated the settlement by posting in February about how many cars the company will produce this year without consulting an in-house securities lawyer, who then reached out to help him craft a clarifying tweet a few hours later. The SEC asked Tesla and Musk the day after he sent the tweets whether the initial post was pre-approved. It had not been, nor had any other tweet Musk had sent since Tesla’s new communications policy went into effect Dec. 11. Cheryl Crumpton, an SEC attorney, argued Thursday that Musk “recklessly tweeted out information that has no basis in fact.” Musk’s lawyer countered by saying there wasn’t a clear enough standard for what tweets would need to be pre-cleared. Judge Nathan agreed. “Take a deep breath, put your reasonableness pants on and work this out,” Nathan said, giving the SEC and Musk until April 18 to go back to the negotiating table and rework the agreement language so there won’t be any ambiguity on what the CEO is and isn’t allowed to post without getting them approved.